En Ka Exchange - "Dress for Less"
In October of 1944, the En Ka Society opened a What-Not Shop on Church Street. It featured furniture and various households goods. 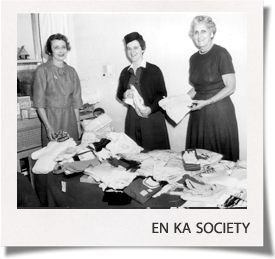 In 1958, the En Ka Exchange was opened with an emphasis on clothing. Even though the location has changed over the years before settled into 1037 Main Street, the Exchange has always provided its customers with bargains and a much needed opportunity to "dress for less." The En Ka Exchange is a clothing store located on 1037 Main Street in Winchester, MA. It is managed and staffed entirely by En Ka Society volunteers. Proceeds benefit local organizations to which the En Ka Society provides financial grants.